Vasily Surikov was born in Siberia, in Krasnoyarsk, in a family of hereditary Cossacks. Among the founders of this city are his ancestors, the Don Cossacks. Repeatedly, he spoke of his origin with the greatest pride; scenes from the Cossack life and colorful images of the Cossacks go through all his work. The artist was always worried about the historical authenticity of his paintings. He dreamed of using his art to show the viewer the greatness of Russia. A small-sized painting “Cossack” was created by Surikov in preparation for the creation of the legendary canvas “The Conquest of Siberia by Yermak”. At this time, the artist wrote a large number of vivid works, drawing picturesque images of the conquerors of Siberia. This work was of particular importance to the author, since among the Cossacks who came to Siberia were Surikov’s progenitors. Fascinated by the upcoming global work, the author, one by one, creates a series of brilliant portraits. The man depicted in the picture is no longer young; the artist was well able to convey his cunning, inquisitive, somewhat insane look. Matted hair and uncut beard indicate that this character is far from the benefits of civilization and is on the way not for the first day. 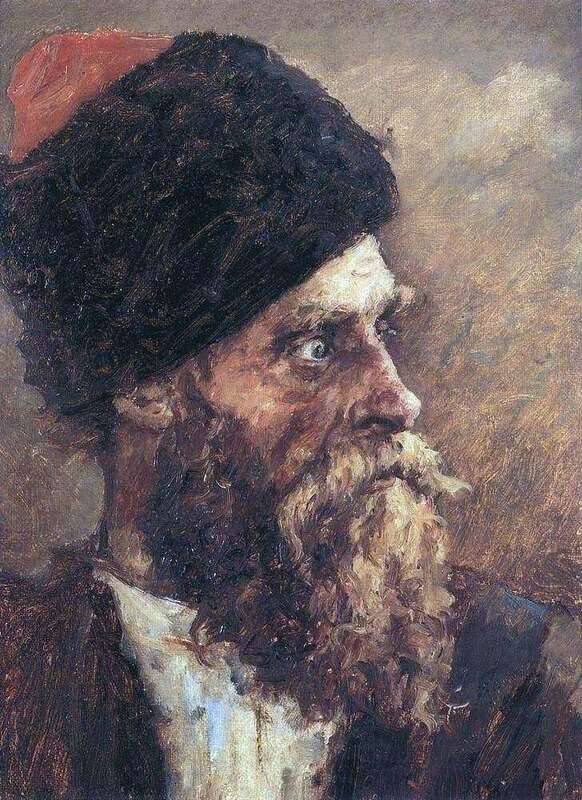 When creating this image Surikov reached incredible heights of expressiveness. Even now, a century and a half after the creation of the picture, we understand the character of the hero – formidable and merciless, but at the same time tired of life and somewhat desperate. Surikov does not strive for the absolute beauty of form, is not in a hurry to improve reality – he paints the world as he sees it. But even when he portrays the dark and unsightly sides of his characters, the artist’s pride in his great land is felt in his works.